I'm nestled in the corner of a café as I write this. It's the only one in Allihies, a colourful seaside town whose entire main street can be walked in just a handful of minutes. Musical Irish voices swirl around me; the waitress is making small talk about the rain. I order the pot of tea, because somehow the black tea with milk and sugar I try to replicate at home never tastes as good as it does in Ireland. It takes me back to afternoons with my Irish grandma before she passed away, giving me very milky, very sweet tea when I was just five or six. Barry's Gold is the secret, I've learned. Yesterday we rode the ferry to Bere Island. My relatives led us on an eleven-kilometre trek over its rugged peaks and valleys, past bleating sheep and jagged cliffs, to the most breathtaking views I've ever seen. We were met with both baking sun and bone-chilling rain. Layers came on and off multiple times, but I wore my Betina Lou Celeste pants through it all. My cousins looked like true hikers in their more appropriate shorts and fleeces, while I walked in my tan flared pants and white turtleneck, as though ready for a spontaneous photoshoot. To be fair, I didn't really know what to expect -- I had been given the impression we'd be walking down the paved road that winds around the island. But let this be a testament to how comfortable and flexible Betina Lou's exquisitely made garments are. The sturdy pants lasted through a long hike, never giving me any discomfort, just warm enough for the rain and cool enough for the sun. Betina Lou is a Montreal-based slow fashion brand with a focus on timeless, vintage-inspired, thoughtful designs. All of their garments are designed and cut in Montreal, then put together locally by small teams. Their fabrics are manufactured mostly in North America, Europe, and Japan. I've long been an admirer of their work, and was beyond thrilled to have the opportunity to review some of their pieces. So, summer essentials. I use the word "essential" loosely, mind you. Food, water, family -- these are essential. Some form of clothing on our backs is essential. Having the same summer dress as a blogger is not -- though we are incredibly adept at convincing ourselves otherwise. #guilty. If you are content with your summer wardrobe, enjoy these photos taken by my talented friend Suzanne (shot in Calgary, not in Ireland, sadly), then smile and click the little "x" on your browser when you're through. But if you're on a journey towards a slower wardrobe and are looking for some versatile summer pieces to invest in, if you have some glaring gaps in your wardrobe, I hope you find some value in this post. I think every summer wardrobe needs a pair of long pants for the milder days; pants that can be dressed up or down, but even better if they can transition into fall and winter as well. Adding a bit of a flare or wider leg lends a light, breezy look to your outfit. And if you're loving the 70s silhouette trend as much as I am, well, even more reason to have a pair in your closet. 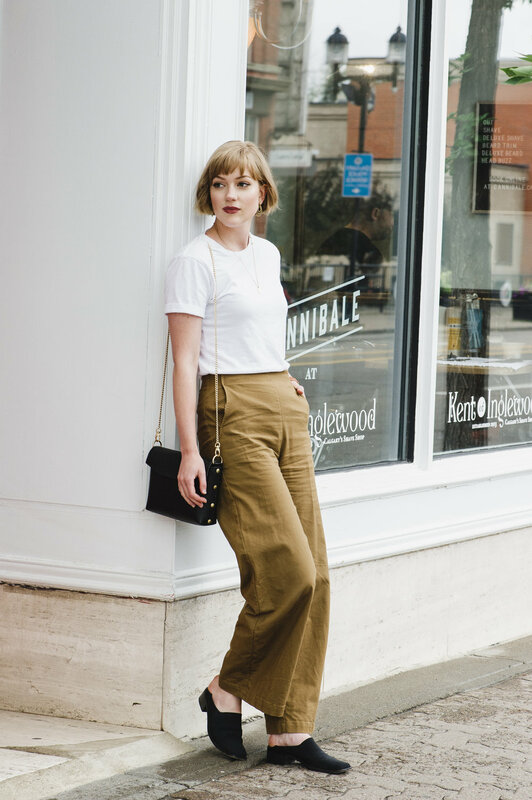 My long summer pants of choice are these Celeste pants in the shade Sahara from Betina Lou (and they just so happen to be on sale). They're an easy choice for any August day that's not absolutely sweltering, but I'll also be wearing these year-round, thank you. They feature a high-waist that's just the right height (have I mentioned I'm very particular about my high waists? ), a flattering colour and shape reminiscent of the well-loved "Kamm" pants, and a gorgeous, machine-washable cotton weave. These will certainly be a fall staple for me as well. Fit: I adore the fit of these pants. 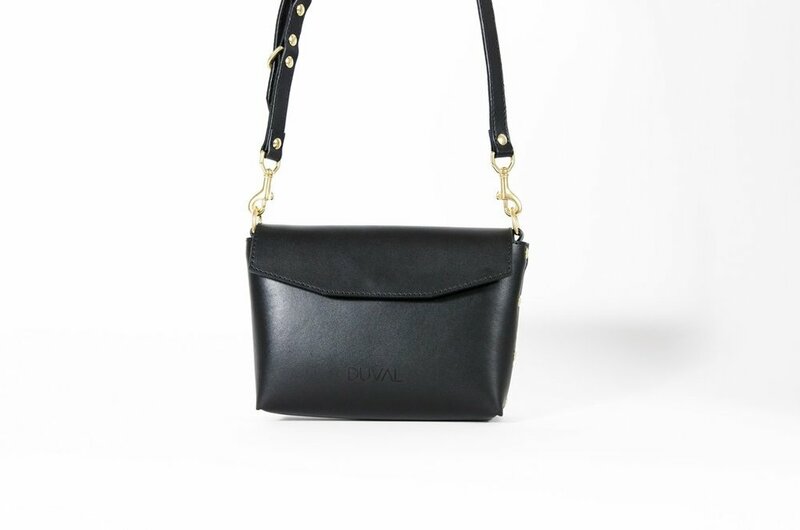 They're sturdy with just a touch of stretch, featuring side pockets (yay!) and a side zipper. I'm wearing a size S and am 5"7 with a 27" waist, for reference. Sizing: Betina Lou offers sizes XS - XL for these pants. Price: As far as versatile, quality, ethically made flared pants go, these ones are quite well priced at $220 CAD. BUT they are currently on sale for $187! Compare that to the very similar sailor pants by Jesse Kamm, which are about $514 CAD with the current dollar. I bought my first plain white tee last year (it took me that long, if you can believe it). It's probably one of my favourite items in my wardrobe now, but finding the right one was a hassle. I hunted through many stores in the women's section, but all of the tees they offered women seemed to be thin, gauzy pieces of cloth that draped oddly or were virtually transparent. I eventually found a Levi's pocket tee, which was fine, and I still wear it. But it wasn't until I received this tee from Betina Lou that I realized unisex or men's tees are absolutely the way to go. I'm wearing the organic Marmier tee, made by the slow fashion brand Marmier and sold at Betina Lou in the men's section of their shop (but considered unisex). It's the quintessential white tee: a classic crewneck cut, jersey knit, a straight, relaxed fit. It's a gorgeous opaque material -- I want to say it's heavy, thick, but that's only in comparison to most women's tees -- the cotton is still wonderfully light and breathable for summer. You won't find me looking for tees in the women's section any more. Fit: I'm wearing a size XS because I like a slightly more fitted tee, but I could have worn a S for a more relaxed fit or M for a very oversized fit. The tee does run about two sizes larger for women because it's unisex. For reference, I'm 5"7 with a 32" bust. Sizing: Marmier offers sizes XXS - XL for this tee. Price: Normally $38, currently on sale for just $32.30 CAD. Your weather app is forecasting soaring temperatures, and you can't be bothered to put together a complex outfit. Or perhaps there's a nice dinner on the day's agenda and you won't have time to change -- or you just aren't sure of the agenda. Enter the basic white dress. Being able to throw on a simple, stylish piece without another thought is, in my opinion, a summer essential. Perfect for keeping extra cool the warmer days or just finding elegance in afternoon errands. I'm wearing the Manu shift dress in Ivory from Betina Lou. I've chosen to keep it market-casual with flat sandals and a gorgeous handwoven bag from ethical boutique Artisan & Fox, but heels and a little purse would easily dress it up for a night out. Fit: I love how this shift dress drapes. It has a bit of stretch without being snug and clingy (*cringe*) and falls straight down, like a long tee. It hits about mid to upper thigh on me, but this would change depending on your height (once again, I'm 5"7 for reference). I'm wearing a size S. The little drop-opening in the back is such a delicate, beautiful detail. Fabric: 70% viscose, 24% polyester, 6% elastane. Sizing: Betina Lou offers sizes XXS - XL for this piece. Colour options: Available in white, black, and indigo. Price: Normally $160, but on sale for $136 CAD. Disclosure: This blog post was not sponsored, but I was gifted the items from Betina Lou and contains an affiliate link (for a different brand). As always, all opinions are my own.